Some years ago I saw a rom.com where the American heroine visits London for the first time. She lands at Heathrow and takes a cab to wherever she’s staying – somewhere fashionable with a SW postcode. She peers excitedly through the cab window as Buckingham Palace, the Houses of Parliament, St Paul’s Cathedral and Tower Bridge whizz by. I thought: where the hell is the cabbie going? Then the penny dropped: his circuitous route in the wrong direction had nothing to do with the real London; it was a fictitious ‘London’. I’d always felt much the same about the cigarette factory in Seville in Bizet’s opera Carmen. It must be fictitious. Bizet took his plot from a novella by Prosper Merimee and I doubted whether either of them had actually been to Spain. Merimée probably thought Seville sounded romantic and what was really important wasn’t the unlikely cigarette factory but the romantic toreador at the centre of the story. The truth is rather different. Merimée (1803-1870) was told the story of Carmen by the Spanish Countess de Montijo (whose daughter married Louis-Napoléon and became the Empress Eugenie). 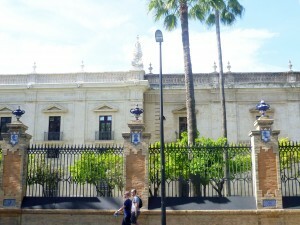 Royal Tobacco Factory, Seville; note the moat in front of the fence. 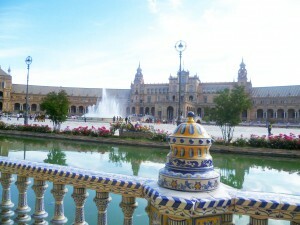 And then I went to Seville. I was there seeing things Roman and Moorish but, as we walked past this opulent building, our guide threw out in passing: ‘Carmen’s Cigarette Factory.’ I was staggered; so it really existed? It could easily pass for a palace. And that, in a way, is what it was. King Fernando VI’s Royal Tobacco Factory was founded in 1728 and completed in 1771. 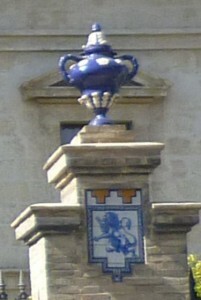 It has classy finials on the roof; tiles depicting the Royal Lion; there is a deep moat, sentry boxes like pepper pots at each corner, and even a drawbridge. At the time, it was the second largest building in Spain – only El Escorial in Madrid was bigger. It was plainly a very important place, built to turn tobacco leaves (from Latin America) into snuff. At its height, the Royal Tobacco Factory had a workforce of 8000 men and was earning the king a fortune. By the 1830s, the Royal Tobacco Factory had switched to making cigars and the workforce comprised 6000 not particularly well-paid women. Inevitably, they smuggled out tobacco and sold it on the black market. The moat, the drawbridge and the soldiers were for real and the factory had its own prison. 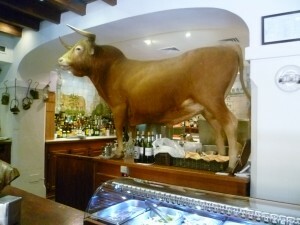 Seville restaurante with stuffed bull; patronized by famous bull-fighter, Manolete. Suddenly, the plot of Carmen made sense. Don José is a corporal of dragoons and he’s there to stop the girls from smuggling tobacco. What’s more, Carmen is in cahoots with a gang of tobacco smugglers and she runs rings round Don José – detaching him from his girl-friend, Micaela, and then dumping him in favour of the bull-fighter, Escamillo. Act 1. Carmen is a cigar-makeress from a tabago factory who loves with Don José of the mounting guard. Carmen takes a flower from her corsets and lances it to Don José (Duet: ‘Talk me of my mother’). There is a noise inside the tabago factory and the revolting cigar-makeresses bursts into the stage. Carmen is arrested and Don José is ordered to mounting guard her but Carmen subduces him and he lets her escape. Would Katheine of Aragon have stayed in the summer palace when she was a child? I love the blue and white pottery details – beautiful. This post has made me resolve that I must watch Carmen soon, if only to see for myself Don Jose’s mounting guard the revolting cigar-makeress. That’s an interesting question, Prem. The Alcazar was built for Pedro the Cruel in the mid-fourteenth century, so it’s certainly possible for Katherine of Aragon to have stayed there. 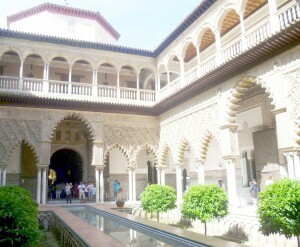 It’s the oldest royal palace still in use by the Spanish royal family. It has some lovely gardens, too. What I like about the opera is that Carmen isn’t your typical operatic heroine – pure and uncomplaining. She’s actually pretty wicked. She smokes, she smuggles tobacco, she behaves badly towards men – and all this shocked the opera’s original audience. She’s certainly not a female role-model. On the other hand, she has a vivacity and an allure which means that, if it’s sung and acted well, you can’t take your eyes off her. I love that Paris description! What a brilliant story. I know Carmen somewhat from seeing it on stage and the fabulous Spanish flamenco production on film. How fascinating to find out the background is actually true to a degree. And what a fantastic Tobacco factory! Thank you for dropping by, Liz. I’m so pleased you enjoyed it. 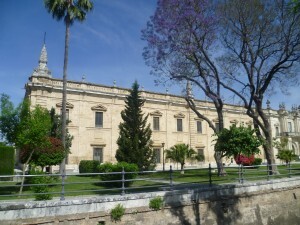 The Royal Tobacco factory ceased production in the 1950s and the magnificent building is now part of the University of Seville, which is a much more fitting role for it.